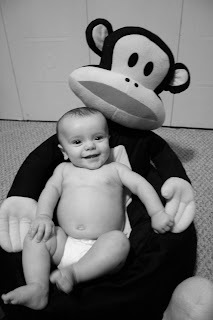 Every month I take a picture of Elias on his monkey chair. Watch him grow! I was just thinking when you were going to post more of thes pics. I love them he has gotten so big! What a great idea! He’s such a cutie! That is such a neat idea! I wish I had thought of that with my three boys. He is so cute! I have really been enjoying keeping up with your blog. I can’t believe how big he is getting! I love that~ Adorbale little man you have. These look great- and I love the chair!! What a great idea to record his growth. He is absolutely beautiful! Awesome idea! He’s so big! Oh how sweet! I wish I had thought of that when my girl was tiny! Wow!! That really shows how much he’s changed! 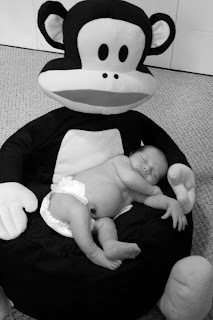 to see how he has grown.. i started at 1 week old then 1 month 2 months etc,…. its fun to see. eventually he got off the chair and was crawling on it for pics heheheh and by it. He turns 1 year old next friday! wow time flies and he is stnding at the chiar now walking kinda… its gonna look so neat all these in his scrapbook each month!! I love doing this… you see how time flies… Dont Blink…. Also I also do same thing how you have him in diaper I put Kai (son) in a white onesie each time… on his bday next week his onesie is still white with aquarius on it this time!!! (www.gap.com) I wish I did this for my daughter, I did do one of her each month but not in the same spots! awww.. Elias is so cute! And Growing so big! That is so cute ! He is such a doll ! it doesn’t take long, does it? He is so adorable! That is an awesome idea and I’m so glad you’re willing to share your pics. with us!! That is so cute! Great idea! what a great idea! will have to do for my next baby! Oh, he’s sooo cute! I like that idea. I was wondering about the monkey pics too! I love them 😀 He is so big now! This is so cute! 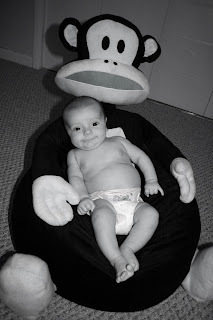 I have seen people do this before with a stuffed animal but I love the monkey chair! That is a wonderful idea, and he is very precious. He seems to be such a happy baby! What a cute idea! 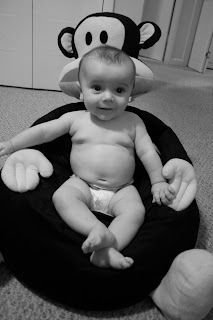 I love your blog and your little boy is just the sweetest thing! He is really cute! We are doing the same thing for 2 month old son. Holy cow! 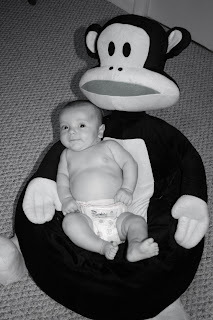 What a great way to see how your little guy has grown! And he HAS grown! What a big guy now! This is super sweet. He has really grown. I love it!!! 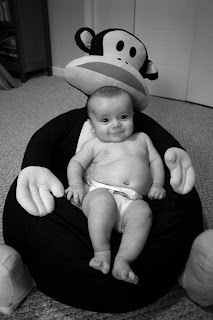 I did the same thing with my son in his baseball glove chair. Isn’t it amazing how huge the chair looks in the first picture, and how it now appears to shrink? Once he turned 1 I have cut it down to a yearly picture. Elias gets cuter and cuter. Heehee, just giggling thinking that in a few months when he is crawling/walking, trying to get a pic of him in the chair will be verrrry challenging :0) Cute idea! He’s always so happy! Cutie! wow! that’s crazy how much they grow in just one month!!! What a great idea to take photos like that each month to document it. I never would have though of that. Wish I had with my little ones. LOVE your blog. 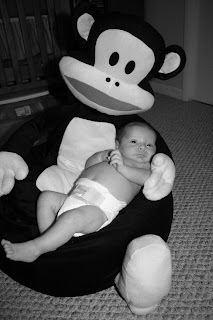 That’s awesome to have that monkey chair for him to take his pics! He’s soooooooo cute! That is a good idea! I did something similar with our 2nd son and it’s so neat to watch them grow and change while that item stays the same. He’s such a cutie!